MPs begin speaking Tuesday at approx. 10am ET / 7am ET, with the debate continuing this afternoon before and after question period. A vote is scheduled for this evening. Post your comments and share your thoughts below! Prime Minister Stephen Harper spoke on Friday, announcing that no ground troops would be deployed, and that the air mission was scheduled for six months. c) continue à offrir son soutien ferme et sans réserve aux courageux hommes et femmes des Forces armées canadiennes qui se tiennent prêts à nous défendre tous. Foreign Affairs Minister John Baird is leading off debate. 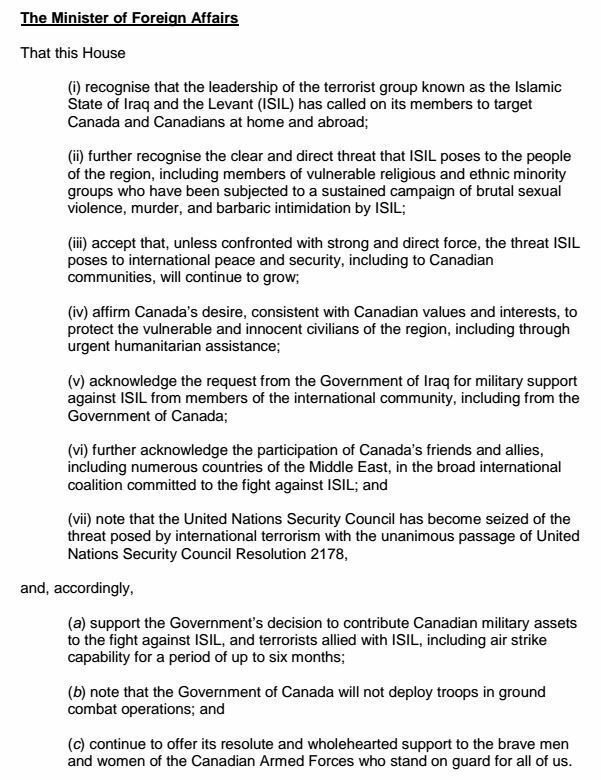 Debate has resumed on the Iraq motion with Defence Minister Rob Nicholson. I find the display of ignorance displayed by both the liberal & NDP leaders in the House of Commons regarding the ISIS mission proposed by the government to be disgusting. It is as clear as the noses on their faces that the butchering by ISIS both in Iraq & Syria of innocent lives manly based on religion does not resemble anything this world has seen since the Nazi's & Hitler during WW.2 . If as Trudeau & Mulcair have suggested that Canada use diplomacy with ISIS to resolve the threat in that region , may they be the ones selected to do so?? They are both Christians I believe. Operational security for military operations dictate that you do not release the number of troops, where they will be staged, what they will do, and most importantly never set a date where they will be removed. Obama did this in pulling the US troops out, and all the bad guys did was pull back rearm and re-equip and wait for them to leave. I listen carefully to the pros and cons if I say that, I only hope we look after our TROOPS, a lot better this time when they get home, ten we have in the past. Will we continue to NOT pay for items that support of TROOPS , that are home now? I am very proud of our military history and the present performance, and I am able to think past the short sighted NDP and Liberal comments. They are playing politics with this very serious matter, and I can only hope serious Canadians let them know this thought, as I am here. Be proud, stand up, and support our great Canadian standing in the world.